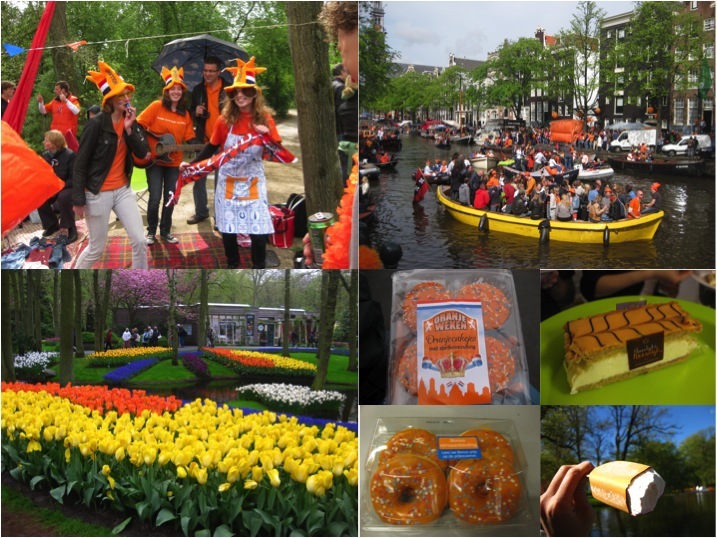 It was great to be back in NL, even better that it was QUEEN’S DAY and SPRING! The Dutch sure are one crazy bunch of party-ers with their wild spirit of wacky orange party antics! With the biggest annual Dutch celebration of the Queen’s (mother’s) birthday, orange is the colour to be in and partying is the central activity on the agenda. But despite being one of the most creative and comedic bunch of people I’ve ever met (when it involves partying or funny random discussions), they aren’t exactly the most adventurous when it comes to food (or as the saying goes: Wat de boer niet kent dat eet hij niet / what the farmer does not know, he does not eat LOL)…..but WAIT, don’t go yet, I’ve still got some treats coming up for you! Although I once complained loads about the monotony of breakfasting on bread with excessively sweet toppings, lunching on the same bread with ham and gouda cheese (one cheese, one ham to be specific. unexplainable. ), dinner on potato mashes (stamppot)… and snacking on cakes and cookies of every shape and size of the same flavours (butter or speculaas)…..experiencing Dutch again after being away for 3 months in Copenhagen was surprisingly comforting. 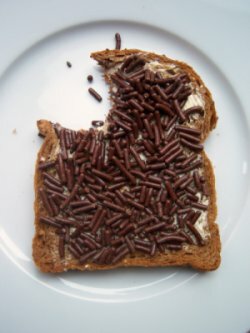 Now, ontbijtkoek (spiced breakfast cake) and broodje hagelslag (bread with chocolate sprinkles) possesses a new charm for me- a feeling of comfort and familiarity that tugs at the heart the way ice-cream sandwiches and kaya toast does for homesick Singaporeans. That’s when I realized I’ve been such a food snob* to judge the Dutch for what is simply Culture. Generously topped on buttered fluffy bread. Delicious! 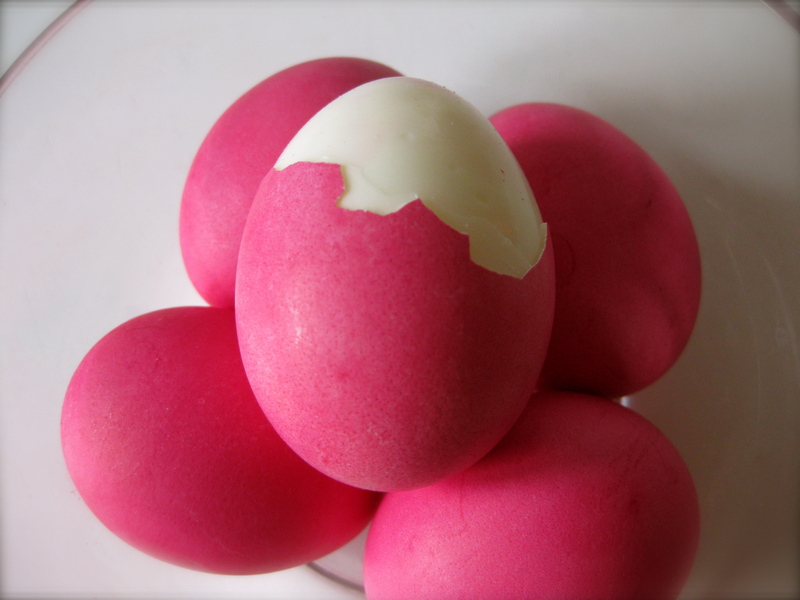 In Chinese tradition, the baby’s first full month (满月 – man yue) is celebrated with a party where parents of the baby give out red-dyed eggs as a symbol of happiness and renewal of life. This is rooted in ancient Chinese culture where a baby’s survival of the vulnerable 1st month is a worthy cause of celebration. 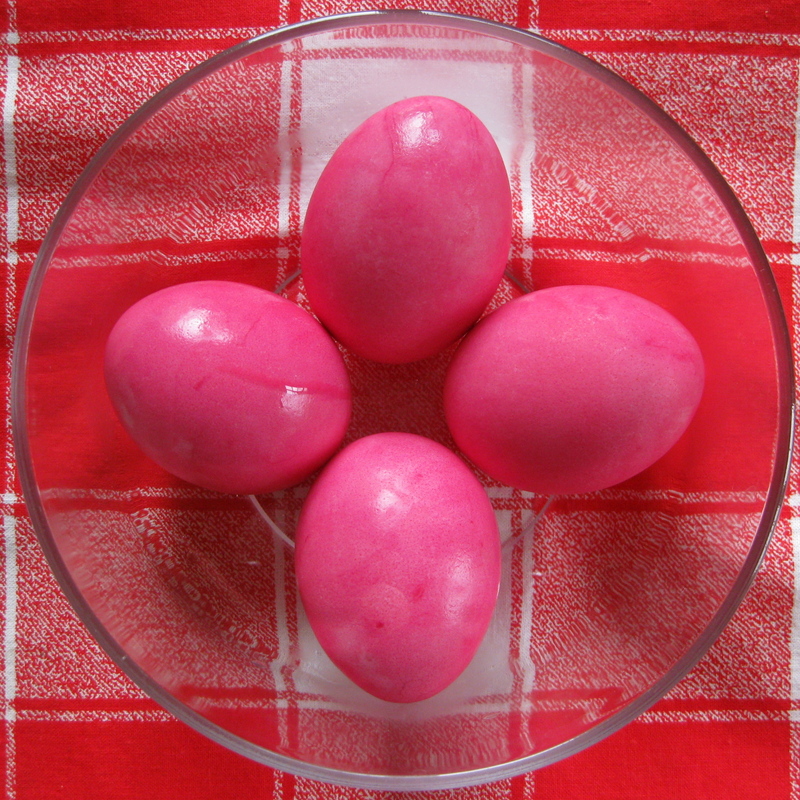 Red dye (I used the red colouring solution instead of preparing from the concentrated powder, hence my pink eggs! Place the eggs in a pot and cover with water. Add a splash of vinegar. Cook on low heat for 30-40min. Spoon individual eggs into bowl containing the red dye and swirl around until you’re satisfied. Remove and leave aside to cool while you do other eggs! One month ago, I created poorskinnychef on a whim, as an experimental venture to catalog both my earthly and outlandish food adventures and share the interesting bits of science I’ve learnt in school. I began with much hesitation, like a baby taking her first steps, even imploring a friend not to publicize it because I wasn’t sure of sustaining this effort. However, as the first comments came in, I started to feel an immense pleasure in writing about food, and sustaining this blog was no longer an ‘effort’ but something I look forward to. 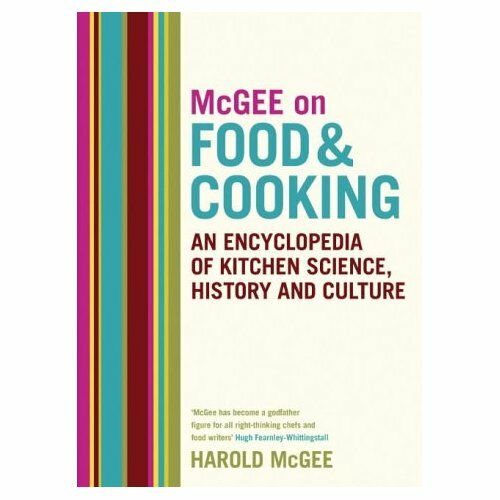 As a month-old anniversary gift to nourish this blogbaby, I’ve ordered Harold McGee’s encyclopedia ‘On Food and Cooking’ from Amazon.uk (due to arrive in a week)! 🙂 Meanwhile, poorskinnychef will be off for six days on a little expedition out of Copenhagen and will be back soon with more yummy stories to tell! Now in beautiful hard-cover! 😀 Can’t wait!! 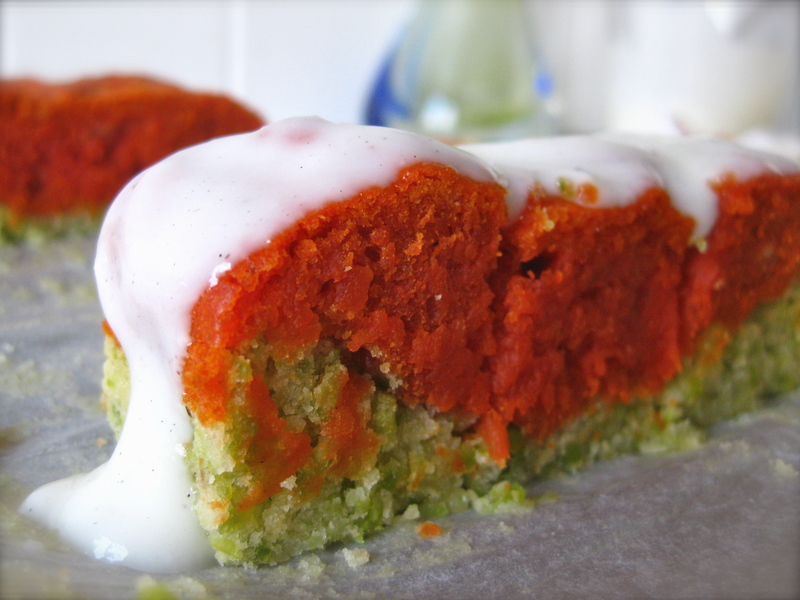 FAB – Tangy Tomato Peas of Cake! I’ve always marveled at the amount of resolve pea pickers have. Yes, those diligent diggers who pick every single little pea out of their plates (even the puny Dutch peas and half peas and the pea innards that fall out of their skins). What is it about peas, really? What is it that makes kids say ‘pea-ew’ and parents say ‘eat your peas or I won’t let you have your ice cream’. Is it their flavour? Their freaky dimpled heads? 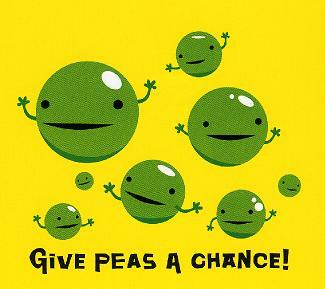 Or their sheer numbers (the thought of fighting 100 peas vs 3 leaves of cabbage)? 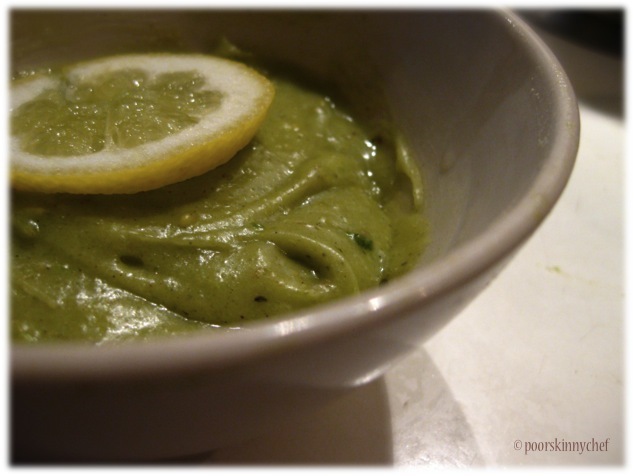 Sneak the peas into the kiddo’s favourite food (but remember, the food still has to look good and taste good). Divulge the identity of the peas only if the kiddo expresses a liking for the cake (positive reinforcement), otherwise blame it on adding too much sugar / fat (aversive learning). hurhur cunning. Stop telling the kiddo to ‘eat your peas, or else…’ (confers negative intrinsic meaning to the peas). Unlike my usual kitchen adventures, this time I followed the recipe to the T, only reducing the batch size and making it into one cake in a loaf tin for easier dividing into bite-sized portions. I must admit that I was rather skeptical at first (peas and tomatoes in dessert?!) but I’m now absolutely won over. The tangy volcanic vermillion tomato layer with the sweet speckled pea layer was a burst of colours and flavours, with a wonderfully soft texture dispersed with nutty green bits of pea. Whoopidolicious! Excellent party food especially for Christmas and Halloween. And btw, it was wiped out at the dinner party I brought it to, despite the warning sign of PEAS AND TOMATO CAKE EXPERIMENT. 4. 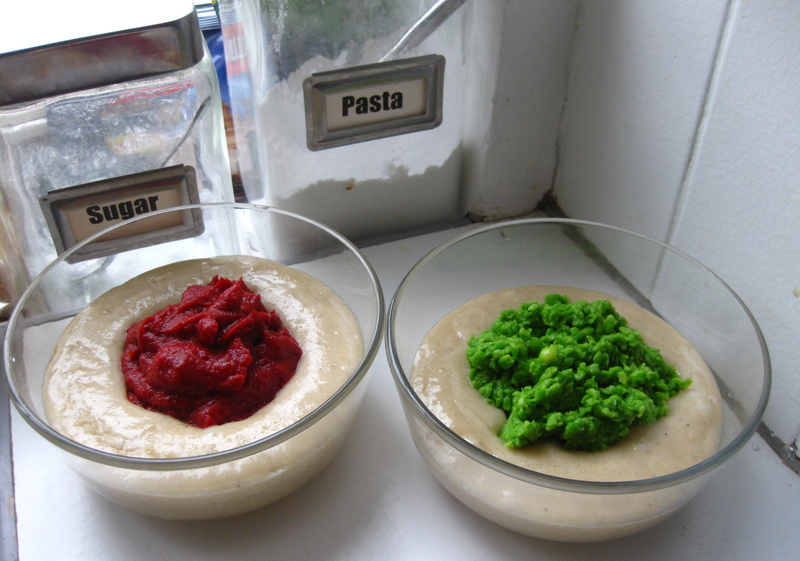 Divide equally into two bowls (about 300g each) and mix in pea puree to one and tomato paste to the other. 5. 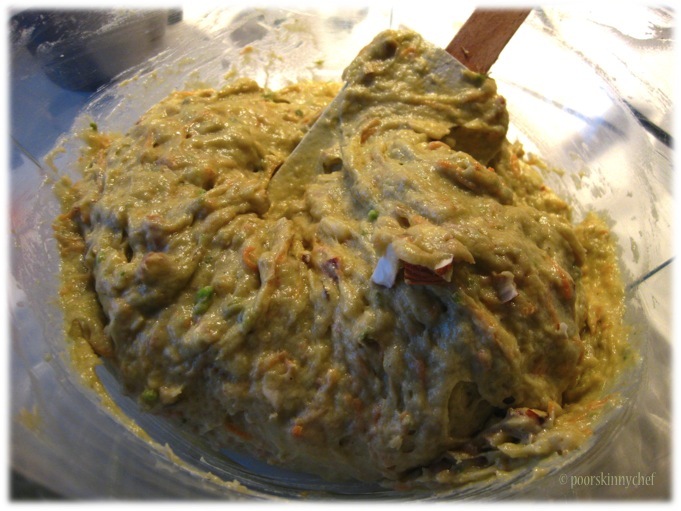 Pour the pea batter into an approx 30cm long rectangular loaf tin (better heat transfer to the centre than a square or round tin), then top with the tomato batter. Use a fork to swirl parts of the layered mixture or drag some pea batter from the bottom if you’d like to create a marble effect. 6. Bake in preheated oven at 190˚C for 25-30min! Tastes great too with Greek Yogurt Vanilla Frosting! 🙂 A lovely healthy frosting recipe from the Cupcake Project. You know how ABC soups with all those ingredients thrown in always inevitably taste so wholesome and good? Now, let me present you with…. *drum roll*…..the ABC cake! To fully appreciate this unique creation, it is first essential to head back to some fundamental ideas that have been hardwired in our cognitive systems since early years. Lesson #1: A for Apple? Wrong! B for Boy? C for Car? Wrong! Wrong! Wrong! The correct answer is….A for Avocado! B for Banana! C for Carrot! 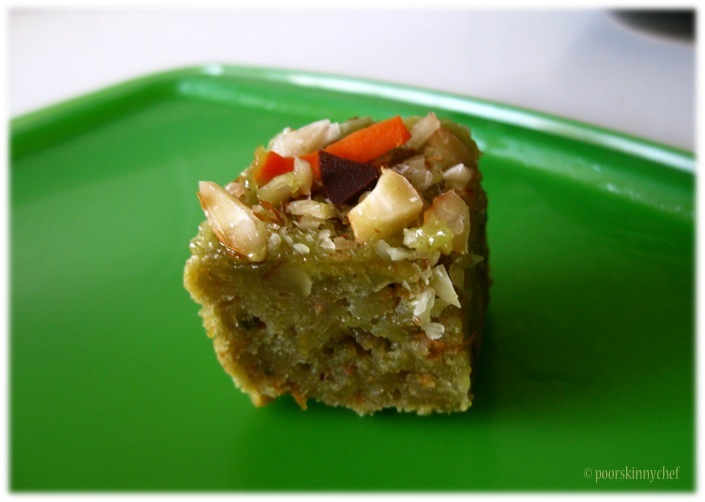 Avocado Banana Carrot Cake is so going to be the new classic when (one fine day) poorskinnychef becomes famous (would you like to help me out here? :)). Within the past 12 hours of its conception, it has won over a German who hates sweet food, a Dane who eats carbs only on blue moons, a Chinese who couldn’t imagine what an avocado would be doing in a cake, and of course a food obsessed Singaporean (yours truly) who has eaten her way through much of the world to confidently proclaim that this cake is a definite winner. Throw in another ‘A’ – for Almonds, and it’s ready to conquer the world! This cake has the same consistency of fudgy brownies, with an incredible softness and moistness like banana bread that is neither sticky nor crumbly, and providing enough resistance to chew without being rubbery like many low fat / fat free cakes I’ve made in the past. Oh and that same fudgy brownie soft crust that crumples when you press on it, ♥♥. In fact, you might even call this ABC the Alternative Brownie Cake! 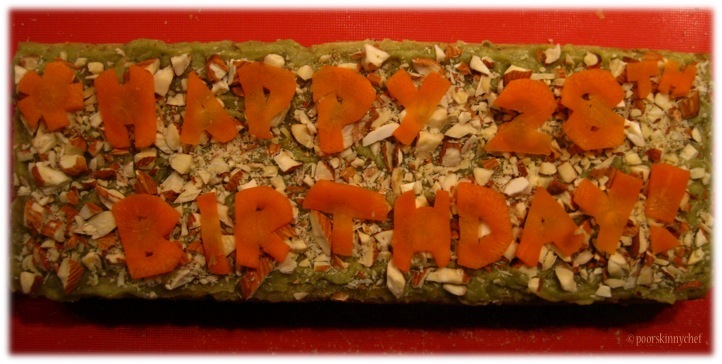 🙂 It’s green (good cake for you hlyf) all through, but still, go ahead and add on a mossy slathering of refreshing avocado lemon frosting *recipe below*, a shower of woody chopped almonds, plant it with raw carrot strips and mark this treasure with a teeny crisp dark chocolate flake. Beauty. The taste? A dominant banana flavour with a recognizable nutty creamy avocado aroma, doubling the goodness of traditional carrot cake and banana bread. Unlike most creamed butter cakes with 50% of the calories coming from fat, this one has about 30% instead (yes I did those geek calculations from the raw ingredients) because all that ABC plant mash-shreds serve part of the function of fat replacement, thus there was only 60g of butter added to my 32 x 11 x 2.5cm cake. There are a few key notes to look out for in order to not end up with rubber or rock when doing low fat cake baking. 1. Knowing your ingredients, and 2. knowing the chemistry of gluten network formation. I’ve been reading up more on baking chemistry and ingredient substitution lately, in order to gain more flexibility with my baking (lower the calories, cut costs and avoid large stocks of ingredients whilst maximizing sensory pleasure). But I’d like to do some more experimentation first before sharing more detailed advice! Ok, enough of geekhood, it’s time to deliver what I’m primarily here to deliver — good cheap simple food with a healthy dose of thought. Enjoy!! 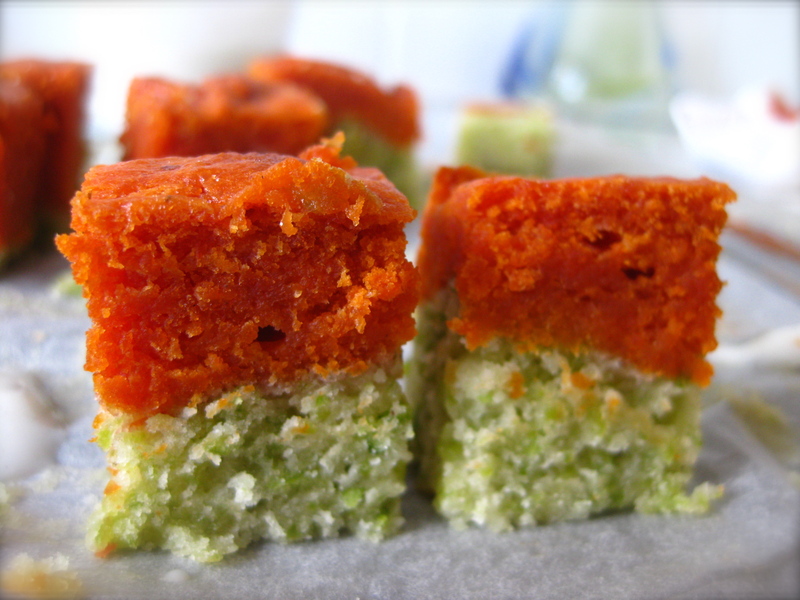 50g of finely grated carrots (about 10cm of a medium carrot) — carrots inspired by Chris & Ying’s delicious looking carrot cake! Bake in tin lined with baking paper at 175˚C for 35-40min (makes a cake of ~300cm2 area and about 2.5cm height).